The genial tubercles are a group of four bony extensions that surround the lingual foramen bilaterally on the lingual surface of the mandible, situated between the superior and inferior borders of the mandible. , Although its development is uncertain, it forms a useful radiological landmark. The presence of lingual foramen was observed radiographically in 28% of the mandibles, whereas periapical radiographs revealed 49%. Studies reveal that the content of the superior canal was found to be derived from the lingual artery and lingual nerve and, for the inferior canal, the arterial origin was submental and/or sublingual while innervations were from a branch of the mylohyoid nerve. Although midline pit on the lingual surface was quoted,  a constant foramen has been observed radiographically. , The anterior aspect of the mandible, which was generally considered a safe surgical area, must receive more attention in view of the vital structures passing through the lingual foramen. However, knowledge of the anatomical structures passing through the lingual foramen is very essential, clinically, in fractures of the symphysis menti, implants and congenital defects and also to avoid pitfalls in the diagnosis of the fracture of genial tubercles. The present study was carried out on 100 dried mandible bones from the Department of Anatomy at the Goa Medical College Bambolim, Goa, India, by examining the lingual foramen, its incidence, location and variations in dentulous and edentulous mandibles. The foramen which were superior to the superior genial tubercles were called as superior lingual foramen and those which were inferior to the inferior genial tubercle were called as inferior lingual foramen. Those foramen in between the genial tubercles were called as intermediate lingual foramen. The foramen present on the right and left side of the lingual foramen were called as right and left paramedian foramen. 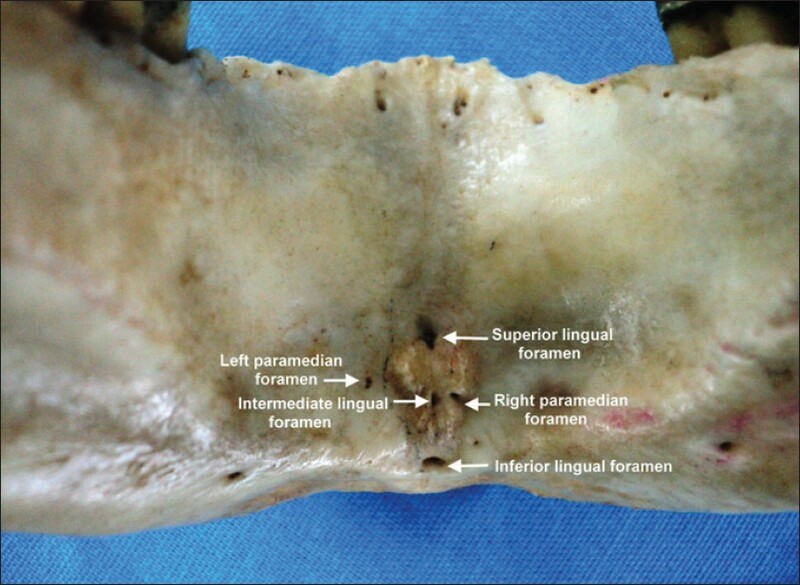 The remaining foramen on the lingual surface were excluded from this study. The location and incidence were noted and statistically evaluated. In our present study, we have observed that the percentage of superior lingual foramen was 58%, inferior lingual foramen was 40% and that of intermediate lingual foramen was 8% as shown in [Table 1] and [Figure 1]. The paramedian foramen present on the right side was 20% and that on the left side was 18% as shown in [Table 1] and [Figure 1]. Various studies have been carried out regarding lingual foramen. Studies also reveal that out of the 50 dry mandibles, 98% had at least one midline foramen. Studies showing a hiked percentage of lingual foramen, 85% and 89%, have also been reported. , This may be due to the consideration of all the accessory foramina. Although the presence of the neurovascular bundle was observed,  a single branch from the left sublingual artery was seen to enter this midline foramen anastomosing with the right sublingual artery without being accompanied by the vein. Fractures of the symphysis menti of the mandible are also associated with fractures of the genial tubercles. It also appears that fracture of the genial tubercles in an atrophied mandible can occur under normal masticatory forces delivered through the mandibular denture. The treatment for fracture of the genial tubercles seems to be quite controversial, as some believe in a conservative line of treatment ,, whereas others believe in the removal of the fracture bone fragments and of the muscles inserted into them. , The present study, which was carried out in 100 mandibles, reveals that the presence of the superior lingual foramen was 58%, inferior lingual foramen was 40% and that of the intermediate foramen was 8%. The present study also reveals that presence of the paramedian foramen present on the right side was 20% and that on the left side was 18%. A similar study was carried out by Nagar et al., wherein the percentage of superior lingual foramen was 72.5%, inferior lingual foramen was 5.98% and single foramen was 1.6% on the left or the right side. There has been no mention of the intermediate lingual foramen as has been observed in our present study. Although Nagar et al. observed a single foramen on either side (1.6%), in the present study, it was observed that the foramen were present on both sides, i.e. 20% on the right and 18% on the left side. No text books in anatomy have mentioned the intermediate and the paramedian foramen on the lingual surface of the mandible. In conclusion, different kinds of lingual foramina have been identified according to their positions, having different neurovascular contents. A further study with microdissection will provide insight on the neurovascularisation of the anterior mandible during surgical interventions. This anatomical knowledge is essential during surgical procedures which may involve potential risks related to the presence of these anatomical variations of the lingual foramen. Preoperative radiographic planning for oral implants should be considered not only from the aesthetic point of view but also to avoid any neurovascular complications and also prior to genioplasties and fractures of the genial tubercles. The present study will definitely provide an immense contribution toward diagnosis so as to rationalize the line of management and treatment both clinically and surgically. 1. Goebel WM. Fractured genial tubercles. J Prosthet Dent 1978;39:603-4. 2. Reifman S. Genial tubercle fracture. Report of a case. Oral Surg Oral Med Oral Pathol 1969;27:595-7. 3. Sweet AP. A statistical analysis of the incidence channels and foramina in five hundred periapical radiodontic examination. Am J Orthod 1942;427-42. 4. Liang X, Jacobs R, Limbrichts I, Vandewalle G. Lingual foramen on the mandibular midline revisited: A macroanatomical study. Clin Anat 2006;20:246-51. 5. Poyton HG, Pharaoh MJ. Oral Radiology 2 nd ed. Hamilton: B.C. Decker; 1989. p. 56-9. 6. Kasle MJ. Atlas of Dental Radiographic Anatomy. 3 rd ed. Philadelphia: W. B. Saunders; 1989. p. 76-7. 7. Manson Hing LR. Fundamentals of Dental Radiolography. 2 nd ed. New York, Elsevier; 1985. p. 96-8. 9. Shiller WR. Wiswell OB. Lingual foramina of mandible. Anat Rec 1954;119:387-90. 10. Nagar M, Bhardwaj R, Prakash R. Accessory lingual foramen in adult Indian mandibles. J Anat Soc India 2001;50:13-4. 11. Maw RB, Lindsay JS. Conservative management of genial tubercle fracture. Oral Surg Oral Med Oral Pathol 1970;30:445-9. 12. Smyd S. Fracture of genial tubercles. J Am Dental Assoc 1957;55:136-7. 13. Shipman B. Genial tubercle fracture: A case. Va Dent J1976;53:7-8.